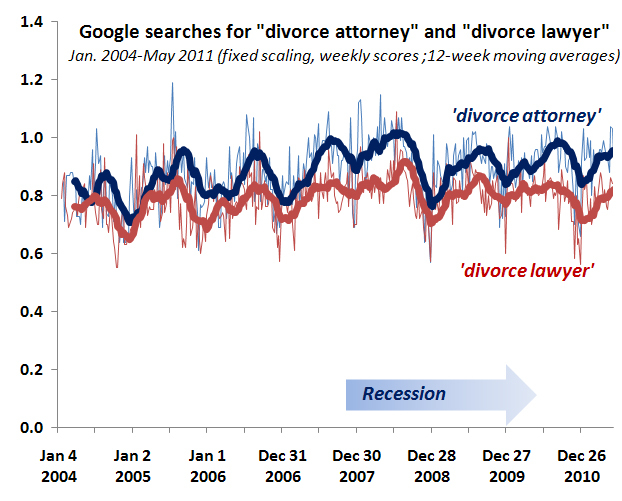 I haven’t yet seen any definitive evidence that the recession has had an effect on divorce rates. But if I’m going to pick on other people for this, I should offer a few ideas. In a previous post I cited a lot of reasons to expect divorce would increase as a result of family stress and instability. Others claim these hard times are bringing couples together in the face of adversity. And either – or both – of these influences is woven into the long term trends in divorce. Here are three graphs looking at the question. I made the dots larger according to the population sizes, and weighted the red trend line so that the larger states have more effect (this positive relationship is statistically significant at the 99% confidence level). 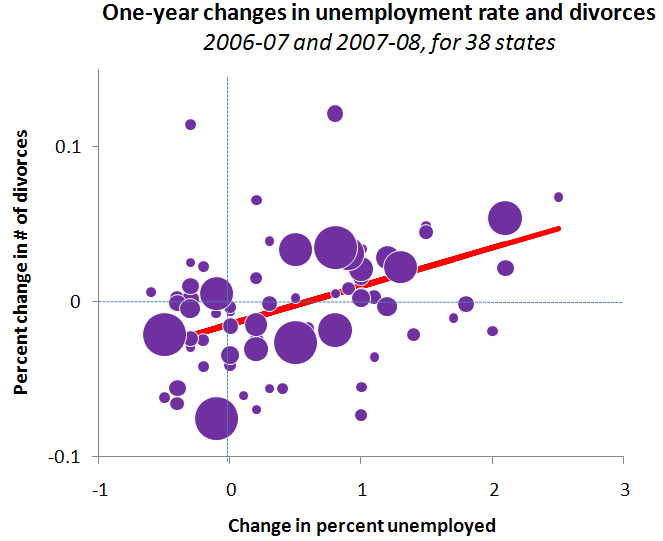 This is just a start, but it leans in the direction of unemployment increasing divorces. At least it doesn’t look like the recession is driving divorce down. 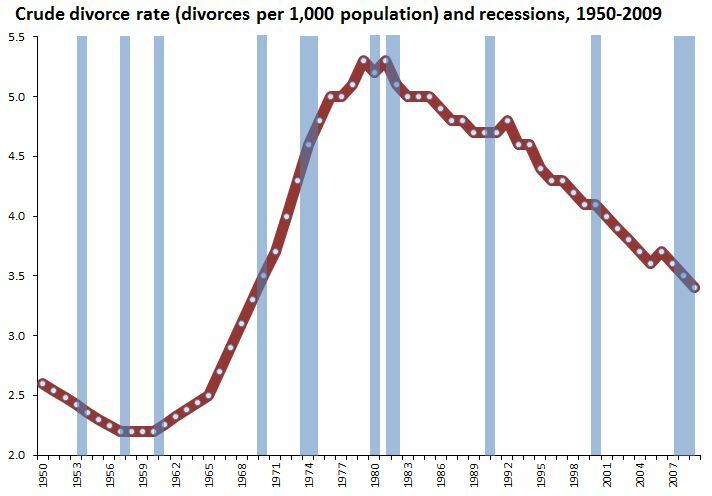 My conclusion so far: no national evidence of a recession effect on divorce yet, but some suggestive hints worth keeping an eye on — leaning in the direction of recession causing more divorces — in opposition to a long-term downward trend. Maybe if and when the housing market loosens up more unhappy spouses will take the plunge and move out. The divorce rate may continue to fall, as it has been since the early 1980s, but that doesn’t mean this recession has a “silver lining” for families. The thirty-eight does not, I think, include California. Why not? That means we don’t have divorce data on nearly 1/8 of the population of the US. Including the Golden State into a national data set where it had previously been absent might make a big difference in the results. Marriage/family is not my field so I’ve never bothered to find out, but now again I’m wondering why info on all those Californians is so hard to come by. Jay, my guess is that the recorder of vital statistics in California does not report divorces OR couldn’t report them in time for the CDC to compile the vital statistics into their report. I think that you are correct that it is misleading to not include California, but I think that the likely reason is bureaucratic rather than nefarious (this is also why vital statistics remain “provisional” for two to three years until they are finalized). It’s probably a pretty benign reason, there are a lot of reports that don’t get data from certain regions (you see this a lot when it comes to crime data) but usually it’s not because anyone is trying to hide anything so much as someone just didn’t do it. And given that it’s California it might have been for budget reasons and simply not having enough to pay someone to compile it and give it to the CDC, though that’s just a guess on my part. Is it my imagination, or would it be interesting to graph “divorce attorney” against “divorce lawyer”? It looks like “divorce attorney” responds more to whatever causes the two of them to blip up and down. I would guess that “divorce attorney” is for people who have more money…and perhaps are more serious. Because if it’s true that the one search term consistently responds differently to the blips, that would tend to indicate that the blips — which seem to be regularly spaced — have some particular meaning. Phil, one aspect that I think that Wilcox is overlooking is the fact that the marriage rate also decreased during the same period. In fact, they fall much more dramatically than the divorce rate in the same period (if I were as creative as you, I would make a graph on the same scale as your divorce decline plot). This brings out a larger point. Since marriages are declining, then the population at risk of divorce is decreasing in the same period (since the rate is calculated per 1,000 population not 1,000 marriages); therefore, would we would not expect — without a change in the true divorce rate — a decline in the divorce rate in the overall population? I’m also not a family sociologist, but my understanding is that divorce is more common in the first years of marriage, which would accentuate this bias. Jay: I think submitting marriage and divorce records to CDC is optional for states. California is never there, though it could be had other ways (like the ACS, now). Mike: Ya, I should have pointed that out about the “crude” rate. It’s also affected by other business in the denominator, like birth rates and the life expectancy of widows. Better to have the “refined” rate, in which the denominator is the number of married people (women, usually). That’s harder to produce (especially with the 38-state thing), but it can be done. Best yet is cohort divorce trajectories, which is what Rose Kreider does in the Census report I linked to. But for that you have to wait for people’s lives to happen. All that said, I believe the refined rate has been at least moving in the same direction as the crude rate (up till 81 or so, down since), but don’t quote me on that.